Untold tales behind the release of the imprisoned Cuban journalists. The other day the notorious Manuel David Orrio asked to be my Facebook friend. You can't place the name? Sorry. What about the martyred Orlando Zapata Tamayo? That doesn't ring a bell either? Try this one: Bobby Sands. If you're of a certain age you may remember Sands as the member of the Provisional Irish Republican Army who starved himself to death in Long Kesh prison in 1981. The world was watching. According to the online archives of the Chicago Tribune, Sands's name showed up in that paper more than 50 times during his two-month hunger strike, and when he died, reporter William Mullen covered the funeral. The death triggered demonstrations across Europe, the British consulate in New York received bomb threats, and American dock workers briefly boycotted British ships. Cuba showed its lasting solidarity in 2001 when it erected a memorial to Sands and other IRA hunger strikers in Havana. Sands died to call the world's attention to the plight of IRA prisoners, whom the British had decided to treat as common criminals. Cuba was doing the same with its own political prisoners, which is why Zapata, who'd been behind bars since a government crackdown in 2003, decided to lay down his life in protest. At this point I could easily segue into a brief essay on the transformation of American media—how in our wondrous new age of microlocal online news coverage, no zoning change is too trivial to be reported but complicated international stories fall through the cracks. But the subject I really want to get to is Manuel David Orrio. I first read about him in March 2003 in the Tribune. That was back when the Tribune liked to think of itself as a paper that covered the world and actually had a reporter, Gary Marx, posted in Havana. Marx introduced Orrio as "one of Cuba's 100 or so independent journalists," a wary man who said he'd been "briefly detained, watched by state security, kicked out of his local community organization, denounced in public by a group of neighbors and criticized by Cuban President Fidel Castro on television for being counterrevolutionary." His work couldn't be published in Cuba but it was posted on CubaNet.org, a Miami website "funded by the U.S. government." At the moment, Marx wrote, Orrio was lying low. The Cuban government had just rounded up 75 members of the opposition, including 29 journalists. Orrio didn't want to be the 30th. A few days after Marx's story ran, the most celebrated of the arrested Cubans, poet/journalist Raúl Rivero, went on trial for treason. And Orrio testified against him. The communist newspaper Diario Granma explained that for 11 years Orrio had been working undercover as a "paid mercenary" for the American government office in Havana. Unbeknownst to his Yankee masters, he'd "infiltrated 'laboratory dissidents,' journalists who never truly were, and 'diplomats' dedicated to espionage and internal subversion." At last the truth could be told, and Orrio, the newest hero of the Cuban people, could bask in the "applause and affection of astonished neighbors." Poor health and a high international profile caused Rivero to be freed in 2004, but he was one of the few. Most victims of the 2003 crackdown were still in prison when Zapata stopped eating. He didn't die in vain. In March the European Parliament condemned Cuba for Zapata's death. In June a senior Vatican diplomat called on president Raúl Castro; on July 6 Spain's foreign minister paid Castro a visit. The next day the Catholic Church in Cuba announced that 52 prisoners arrested in 2003 would be freed, including 20 journalists. As they've been released they've been flown to Spain. Even in this new era of backyard-absorbed American media, the prisoner release crossed the threshold of newsworthiness. Zapata's name actually appeared twice more in the Tribune by way of background. And thinking about him for the first time in nine years, I wondered what Manuel David Orrio had to say. I found him on Facebook and dropped him a line. Among Cubans there's a word for Orrio, my Cuban-born friend Achy Obejas tells me. That word is chivato—stool pigeon. 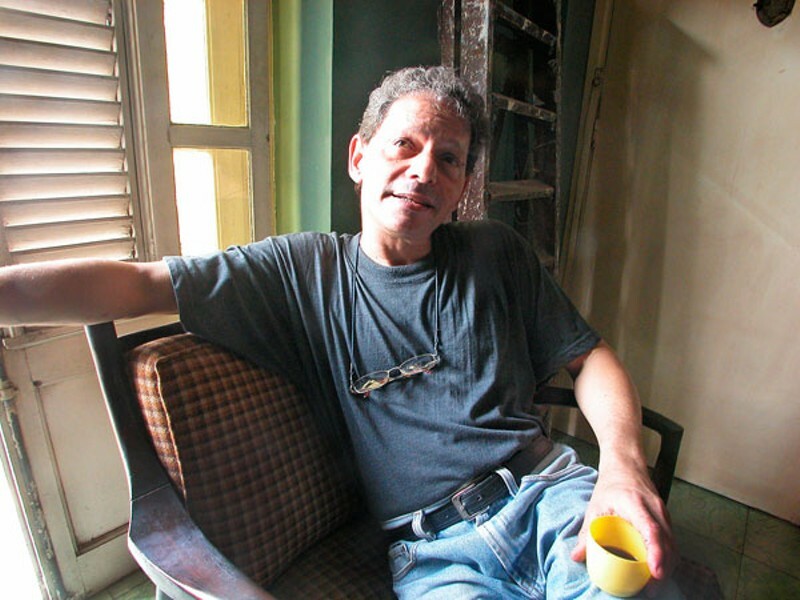 "He's tagged with that forever," says Obejas, a novelist and Vocalo blogger whose fiction is set either in Cuba or among Cuban-Americans, "and even among many of the very high up and committed pro-rev folks I know, he's considered untrustworthy—a pariah." Orrio got back to me immediately. He gave me his e-mail address and said he'd rather correspond that way. And then he asked me to be his Facebook friend. When a day went by and he hadn't answered my e-mail I decided to butter him up. I accepted his invitation. Then he wrote again. He said he'd just laid out his views on the release of the prisoners in a piece posted on kaosenlared.net, a Spanish-language, anticapitalist website apparently based in Barcelona. He began the piece by asserting that he opposed censorship in Cuba and considered himself a victim of it—hence he was not writing this for a Cuban paper. He had no regrets seeing the "counterrevolutionary prisoners" of 2003 set free, as their imprisonment had become an "anachronism." But neither did he regret having served state security back in the day, for the Cuban government then was facing a serious threat from the U.S. and had no choice but to act. He pointed to fresh evidence of this: an interview on the Univision radio station WQBA in Miami between Roberto Rodriguez Tejera, former director of Radio Martí, the federally financed broadcasting service aimed at Cuba; and Roger Noriega, a former Jesse Helms staffer who served as assistant secretary of state for western hemisphere affairs from 2003 to 2005. Orrio said Noriega told Rodriguez Tejera that James Cason, who was chief of the U.S. Interests Section in Havana from 2002 to 2005, had clear instructions: provoke the Cuban government even to the point that it would expel him. (Which didn't happen.) Cason's assignment, said Orrio, was "to increase tensions in a direction that easily could have led to military intervention by the United States, just as it was intervening in Iraq. Given that, the actions of the Cuban state were more than justified." Chivato Orrio has a point. As Marx reported in 2003, Cason was offering the dissidents a lot more than moral support. "In addition to funding CubaNet," Marx wrote, "U.S. officials have distributed tape recorders, cameras and other equipment to independent reporters, along with offering them Internet access at the U.S. Interests Section in Havana. Orrio and his colleagues recently held a workshop at [Cason's] home. . . . The workshop infuriated Cuban officials, who say it was an attempt to undermine the government." Obejas wrote me: "There's no doubt, whatsoever, that Cason was sent to Cuba to be provocative, which he surely was. Among his achievements: a gigantic marquee on top of the U.S. interests section building that exhorted the Cuban people to revolt. Absolutely outrageous . . .
"It is no doubt true that some of the 75, but certainly not all, and Cuba didn't even pretend to prove all, were accepting money from the U.S. government for certain activities, such as publishing and distributing 'democracy' materials. . . . This is an unfortunate fact of Cuban political life long before the revolution—the U.S. meddles, the U.S. flexes, the U.S. tries to influence and impose. Me, personally, I wish that no one took a single dime, that whatever Cuban dissidents had to say or do could be achieved without non-Cuban funds. But the fact is that the state controls the media—so if you have something to say that contradicts state dogma, you either swallow it or pursue alternative means. And the fact is that alternative means cannot exist, no matter how modest, without foreign funds or illegal use of state resources." About three years after he first met Orrio, Gary Marx interviewed him again. He found Orrio living in a dark apartment on the eighth floor of a dilapidated old building; he lowered the front-door key to Marx in a bucket because the elevator didn't work. Marx spent three hours with Orrio, who talked a lot about how hard it was to make a life for himself as a good Cuban after so many years of counterrevolutionary pretense. Marx got the impression that Orrio was out of work. Marx never wrote about the interview. "I felt this guy had nothing to say," says Marx. "I just found him to be kind of despicable, this chameleon figure who could be whatever he needed to be, and he'd survive whether the revolution survived or not, someone with no moral compass at all. There was no insight he could provide me I could provide to my readers. Here was a guy who got his 15 minutes of fame and got a handshake from Fidel—and was tossed away." Orrio had been good for one insight only. Finding out that Orrio lied to him "was a very painful story for me," says Marx, "but it was also perhaps the most important moment in my five years in Cuba. It gave me, on a gut level, a real understanding of the place." Marx is still with the Tribune but he's back home in Chicago—to the detriment of Tribune readers with an interest in the world. "It's a country that's so hard to understand it really takes time on the ground to put it in perspective," he says of Cuba. "Without correspondents on the ground there who really know the story, who know the story behind the arrests of the dissidents in 2003, it's very difficult to bring this story alive."